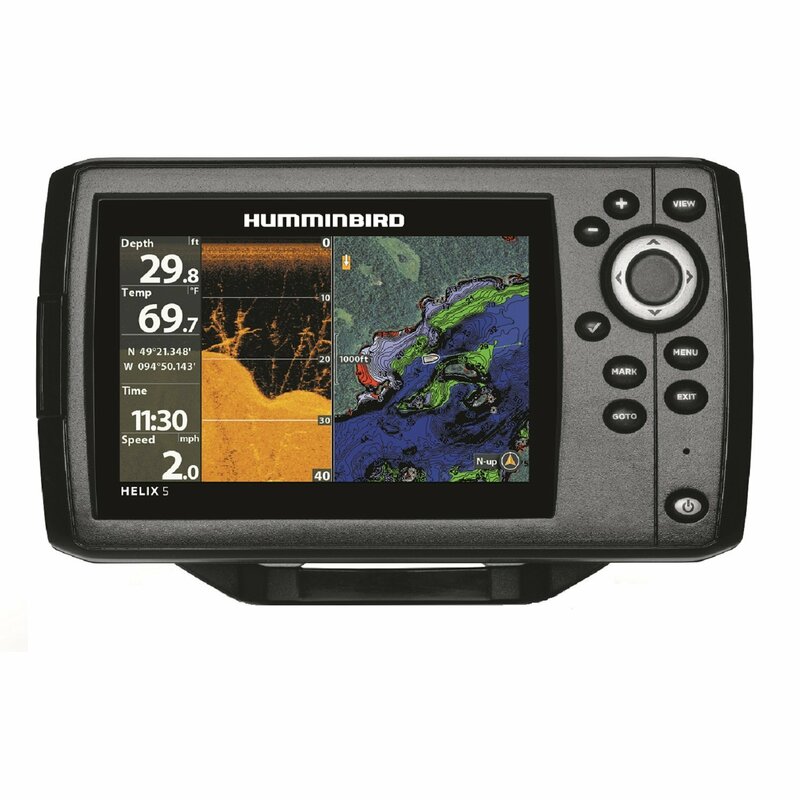 Humminbird 899ci HD SI has an average rating of 3.57 out of 5 based on 7 user reviews. Humminbird 899ci HD SI features the 480′ Side-Imaging technology, which Humminbird began and has mastered. It uses the XHS-9-HDSI-180-T transducer, the same one that was used by the older side-imaging models. The 1000W transducer supports 800/455/200/83 kHz frequencies, and it reaches the depth of 150’ in side imaging mode and 1500’ in broadband mode. The high frequency sonar eliminates the clutter in the water. No matter the conditions under your boat, this unit with cutting edge sonar can deliver one of the clearest displays available. The Side Imaging Sonar offers incredibly clear, virtual photographic images of structure and the bottom. This is the ultimate tool to find structure. The coverage is a massive 480 feet from side to side. Anglers will be able to scan what used to take hours in only minutes. This unit comes with ample features most of which can be found on older models. One of those features is SwitchFire which gives anglers complete control of the 2D sonar display with two unique modes. In Max Mode, anglers can watch the sonar returns on the screen in incredible detail. They will be able to see the smallest objects underneath the water. This provides complete underwater coverage. In the Clear Mode the software will filter the sonar returns and only display structure and fish. This mode is great for reducing the undesired clutter in the water column or fishing in rough or shallow water. The nuances of the display are easy to adjust as well. The new color pallets offer more flexibility on the water whenever dealing with bright sunlight or overcast conditions. The screen is a full 7 inches with the ability to enhance sharpness. The depth, distance and bearing are all displayed at the same time on the screen with large enough numbers to be seen from a few feet away distance. The range lines on this unit have been improved over older models. With this new approach, you can see the exact distance in range between the bottom of your boat and the nearest object. Whether a fish, a sunken boat, or debris, your display will mark the distance with lines shown in footage between you and the edge of the object. Humminbird 899 uses the old 700-series style networking. You will need network adapters or an Ethernet switch to connect this unit to another Ethernet-ready Humminbird. The 899 is equipped with a dual SD card reader. The GPS comes preloaded with Humminbird ContourXD maps and it supports Navionics Gold and HotMaps upgrades. For clarity, ample features, and coverage up to 240 feet on each side of your boat, the Humminbird 899 HD SI offers one of the most complete options for technology savvy anglers. You can get a great deal on Humminbird 899ci HD SI here. 899 trolling 1.5 to 3 mph gps readings jump all over the place. Internal gps receiver don’t seem too great. I have been fishing in the San Juan Islands for 30 years and I thought I knew the area in and out. And then I bought this unit and I couldn’t believe how many great fishing spots I have been missing all these years. I still didn’t get a chance to use all the features on this unit, I’m too busy catching fish. I’m just a weekend angler and I like to get the most of my time on the water. That’s why I went with a side imaging unit that lets me quickly scan large area. If you need side imaging like I do then your choice is simple – you got to go with Humminbird, Lowrance side scan units are much more expensive. Also, Humminbird is much easier to use, I learned how to setup the unit by watching youtube videos. I would also recommend installing the unit on a RAM mount, it makes it a heck of a lot easier to operate. Used 1 weekend still learning the unit very impressed with readability for the Novice Electronics Guy I Am . Lost depth readings at around 20 mph and above . A little more tweaking the Ducer may help ,but I’ve been told that’s about it . It’s a Fish Finder not a Depth Finder. Picking up a little Prop wash, couldn’t mount at least the 15″ away from outer edge of prop because of Factory Lowrance Ducer , gonna rework both further away and separate them more to eliminate interference from wake of each Ducer . Located a School of crappie within minutes and Caught one on first cast , impressed Myself a Little. LOL I give it 4 Stars so far . Navionics is my next Task along with GPS “Back Tracking” to Brush Piles . This an excellent fishfinder but you have to know how to get around its limitations. In order to lower the price, Humminbird ships these units with a transducer that doesn’t support 800kHz frequency. The high definition transducer is what you want, the price for that is $269. What you can do is when you get your new 899, you ship the included transducer back to HB and they will send you the HD transducer for additional $69.99 but you have to call them first. Trust me, the HD transducer is worth the money. Also, the GPS on these units has its problems that have well documented by now. The way you get around that is by getting external GPS puck. Once you do these 2 things plus upgrade your maps you have an excellent unit. My main complaints with this unit is the poor quality of the transducer mount and the unit’s inability to read depth in shallow water. I talked to their technical support several times about the shallow depth readings because it’s a very important functionality for me. They suggested many different configuration tweaks, I found a combination of settings that make the readings a bit more accurate and less erratic but the problem is not resolved completely. highly disappointed in the overall quality of this unit. transducer mount has broken twice. I had to send the unit in for repair because it would not power up. I get the unit back with a note from the tech saying unit powered up fine and that the software was updated. Now 3 months later the unit will not power up again. The unit is directly wired to the battery and I have power all the way to the unit. I write hummingbird a email through there contact us site and get no response.